Did you know I have a famous cousin? I do! My cousin, James Dashner, wrote a book called the Maze Runner. On September 19, the movie based on his book was released in theaters! 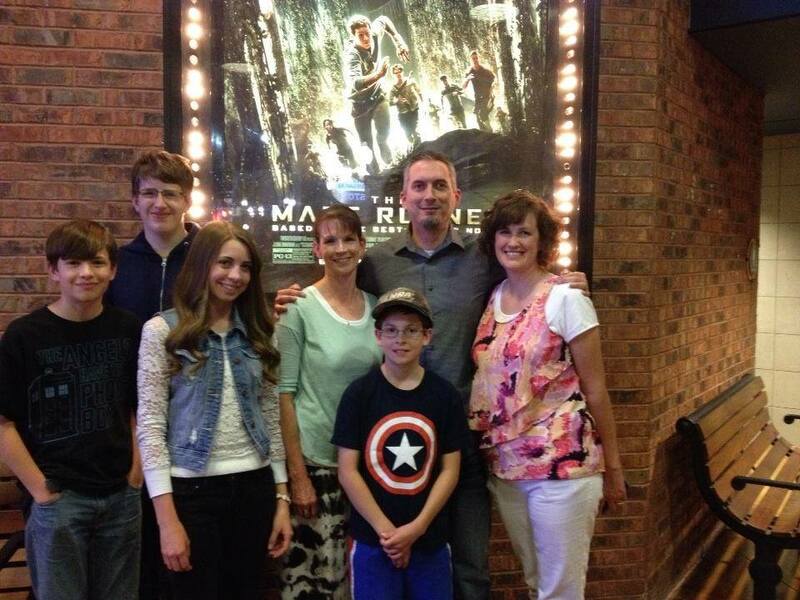 My son Casey and I got to go to a sneak-peak screening with James down in Utah the night before it’s release. Some of you might recognize my sister Kristie and her daughter Kira as two of my super-awesome CookieCon staffers. The giant boy in the back is my son, Casey, and the other two boys are Kristie’s. That’s James sandwiched between his proud-as-punch cousins. I wanted to bring a congratulatory gift, but what do you give a guy whose dreams have literally all come true in the past months and years? That is the magic of cookies, don’t you think? 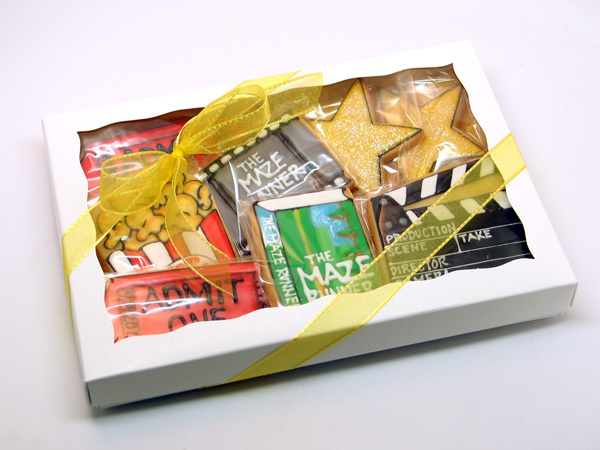 Everyone loves cookies, and the time spent on making them pretty makes them special. Need a gift for the guy who has everything? Cookies! Need a gift for the guy who feels like he still has a long row to hoe in life? Cookies! Both will appreciate their gift equally. Isn’t that amazing? I love it. I couldn’t figure out what shape to use for this, so I just cut it out by hand. It’s pretty easy to hand-cut a mostly-rectangular cookie. If you’ve never tried hand-cutting, that’s a good one to start with. This is something that took me a while to learn, but I learned it from the best. I think one of Callye’s (Sweet Sugarbelle) strengths is her ability to mix in some easy, plain cookies with her fancier (time consuming!) designs. 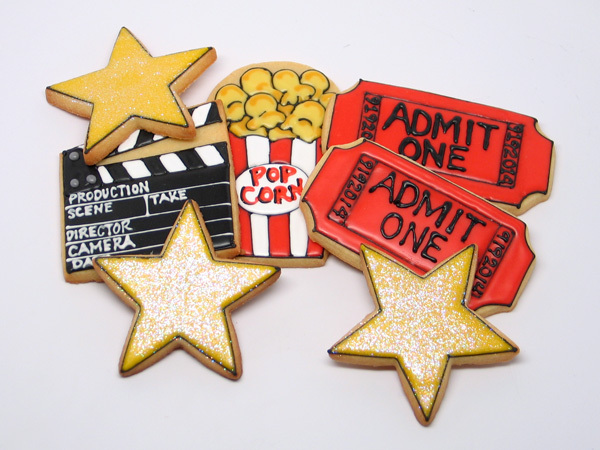 I used to think every cookie I made had to be detailed and extra-fancy. Then I realized, after watching what Callye does, that mixing in some simple cookies not only saves you buckets of time, but it also adds to the overall presentation. 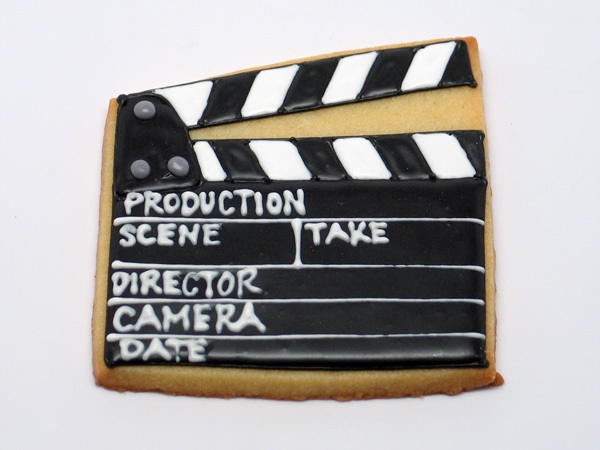 If every cookie is wildly detailed, sometimes it’s just too much to look at. 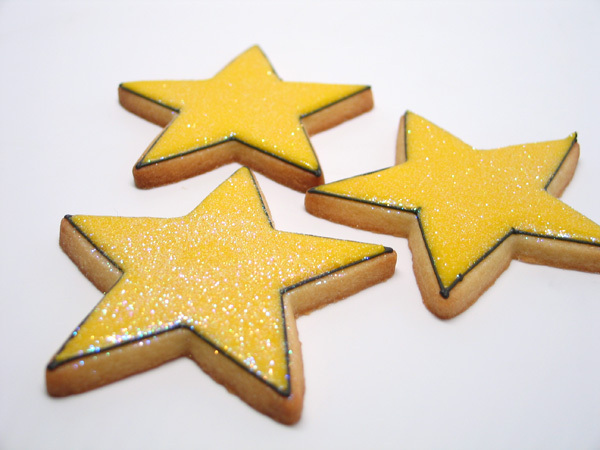 These stars were outlined in black, filled in yellow, and sprinkled lightly with Rainbow Disco Dust. They probably took about a minute a piece! Wish I would have learned this sooner! Then, what’s a movie without popcorn? This was also hand-cut, but you could do it on a tombstone, or on the Ice Cream Soda cutter. Or you could just do it on a plain ol’ rectangle. (Remember that post where I was going to make 100 things on rectangle cookies? Haha… yeah. Well there’s another one for ya!) Actually the clapper could be done on a rectangle, too. It would just need to be closed, which would be equally cute. If you look closely at the book cookie in the middle, you will see that it looks pretty darned bad. But with the others surrounding it, it passes. So anyway, congratulations to my cousin, James! I am so happy for all of his success! And for you, Cookie-Decorating-Reader, keep making cookies. They really are the perfect gift for just about any occasion. 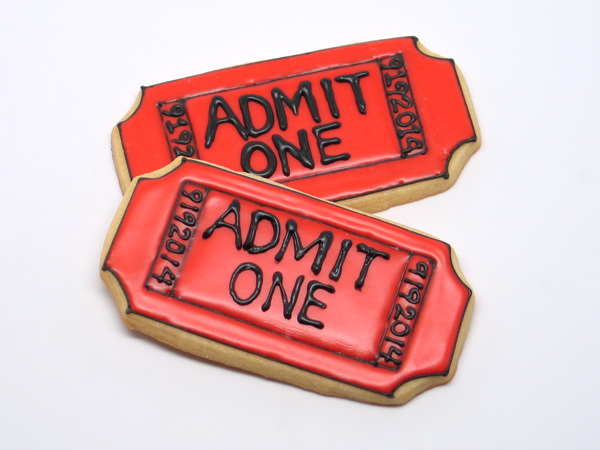 ← Notta Cookie and New Cutters Winners! So cool Karen. I read the whole series and really enjoyed them. It will be fun to go see the movie. Great cookies!!!! These look great, you did an awesome job! You are a very busy lady, website biz and now a blog. You and Mike are awesome! I *LOVE* that popcorn Karen!! My son LOVES the book series. We recently watched the movie. He says the book is way better…of course. Congrats to your cousin and all of his success. Great cookies! Wow! These are so creative i’d love to try these out someday. 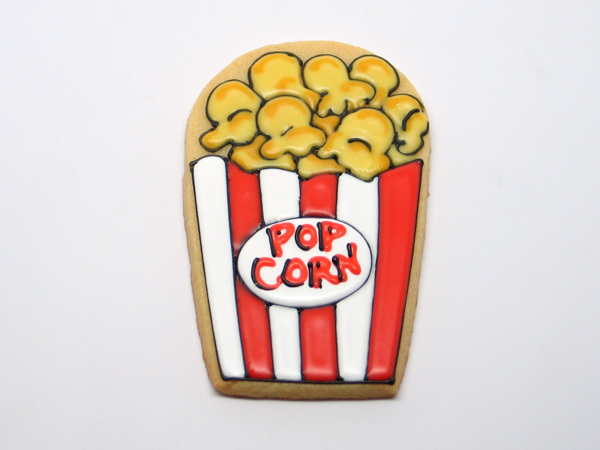 The popcorn cookie is so cute and these details are amazing. I haven’t seen the movie yet but maybe ill watch it someday thanks for the post! These cookies look amazing. But do they taste good? 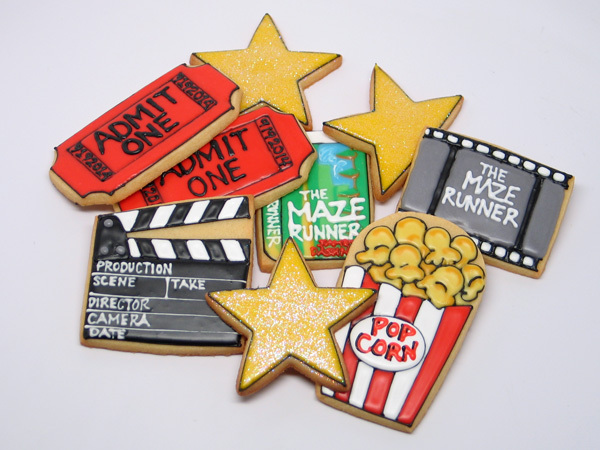 I don’t know if I’d dare eat them, they are too cool looking! If you are an app developer and require mobile marketing then this article is proper for you. We provide app downloads, app installs and app reviews so your app can escape a surmount the experience it deserves. We eat helped thousands of customers to reach more users in the service of their portable app. We pique your app official users, and then your app choice reach the google gambol chart. This works in behalf of all motorized developers. Наша компания занимается поставкой песка. У нас всегда сжатые сроки доставки на морской песок. Мы осуществляем доставку в Санкт-Петербург своими полуприцерами по 100 м3. Конечная стоимость материала составляет 500 р за куб. Купить морской песок в можете здесь, либо по тел. : 8(812)9392339. Помимо того, здесь имеется хорошее предложение как заказать: щебень гранитный фр 5-10 и гавийный 40+, а так же грунт сеяный и вторичные материалы: бой бетона с доставкой нашим транспортом. Хотите узнать подробнее, toyota motors thailand website http://thailandi.info/poleznoe/ – Show more!.. Портал «Захвату.нет» – это довольно необычный сетевой проект, разработчики которого приняли решение уйти от формата классического новостного ресурса и сделали уклон в сторону многостороннего блога, в котором размещаются не обсосанные снизу до верху сторон новости с крупных централизованных агрегаторов, а авторские статьи на общественно полезные темы, которые чередуются с аналитикой. При этом новости не только говорят о каком-то произошедшем событии, а разносторонне анализируют его, с точки зрения различных специалистов. На портале есть огромное количество разделов, поэтому https://zaxvatu.net/ будет полезен пользователям интернета с разнообразными жизненными интересами: начиная от работников здравоохранения, заканчивая представителями чисто технических специализаций. Wonderful cookies, i just love these because they are not only tasty but different also.